Debate unfolds: Man or nature? Likely the stones are a natural feature. 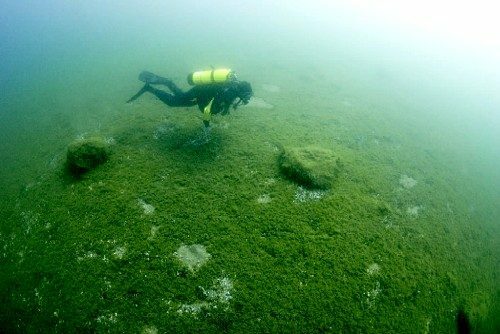 But the possibility they are not has piqued the interest of archeologists, native tribes and state officials since underwater archeologist Mark Holley found the site in 2007 during a survey of the lake bottom. Though the stones could signal an ancient shoreline or a glacial formation, their striking geometric alignment raises the possibility of human involvement. The submerged site was tundra when humans of the hunter-gatherer era roamed it 6,000 to 9,000 years ago. Could the stones have come from a massive fishing weir laid across a long-gone river? Could they mark a ceremonial site? Adding to the intrigue, one dishwasher-size rock seems to bear an etching of a mastodon. This spring Holley and a student from Northwestern Michigan College hope to make laser scans of the image that will yield a computer model. That will help scientists assess the site, which is otherwise off limits because of American Indian concerns that the area could be sacred. Researchers who study early American Indians say they will need more evidence to be convinced the stones are a human artifact. They are especially wary of the idea of a mastodon petroglyph. Mastodons were facing extinction when early humans were on the scene, and the few that still existed in North America lived much farther south, evidence shows. Still, Hank Bailey of the Grand Traverse Band of Ottawa and Chippewa Indians said, “There’s a lot that we haven’t learned.” Moreover, to American Indian eyes, the rocks seem to be arranged with some purpose, he said. Evidence shows human families were present in northern Michigan thousands of years ago. They traversed a barren tundra dotted by stands of fir trees in pursuit of elk and woodland caribou, gathering nuts and berries as they passed. People did not linger in such a cold, marginal land, but they did mine chert for spear points from a site near Charlevoix and left evidence of campsites in the area, Cleland said. Humans of that time frequently arranged stones to dam streams—to trap fish and for other reasons, said Northwestern University archeologist James Brown. “Until they’re investigated archeologically, it’s hard to tell,” Brown said of the submerged formation. To satisfy Grand Traverse Bay’s American Indian community, which wants to minimize the number of visitors to the site, and to preserve his prerogative to research the spot, Holley has kept its exact location a secret. He said he hopes a computer model of the gouges in the mastodon rock will help experts tell whether the features were a trick of chance cut by glacial forces or were the work of ancient humans. Cleland said petroglyphs are rare in the Upper Midwest and stone circles are more common among primitive farmers than among the hunter-gatherers who traveled through Michigan.